We present the results of the first annual Human-Agent League of ANAC. By introducing a new human-agent negotiating platform to the research community at large, we facilitated new advancements in human-aware agents. This has succeeded in pushing the envelope in agent design, and creating a corpus of useful human-agent interaction data. Our results indicate a variety of agents were submitted, and that their varying strategies had distinct outcomes on many measures of the negotiation. 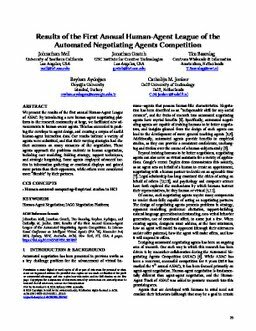 These agents approach the problems endemic to human negotiation, including user modeling, bidding strategy, rapport techniques, and strategic bargaining. Some agents employed advanced tactics in information gathering or emotional displays and gained more points than their opponents, while others were considered more "likeable" by their partners.